At Hi-Tech, under CFD numerical methods and algorithms are used to solve issues that involve fluid flow. Our experts work on softwares that perform calculations useful in simulation of interaction between liquids and gasses. Contact us to know more about our CFD analysis, modeling and consulting services. Under Pressure Distribution, professionals at Hi-Tech offer services in determining the pressure at all points around an airfoil. Flow Visualizations in fluid dynamics make flow patterns visible. Various ways of visualization include Surface Flow Visualization, Particle Tracer Method and Optical Method. Hi-Tech professionals make its application in CFD equally important and result-oriented as in experimental fluid dynamics. Heat Distribution is an integral aspect of Heat Supply. Other key aspects are heat production and heat consumption. At Hi-Tech, the professionals offer services in heat distribution. Hi-Tech offers services into Aerodynamics where professionals study the motion of air, specifically when an interaction between air and an object takes place. Experts in the field take care of compressibility as it is a vital factor in aerodynamics. Engineers at Hi-Tech carry out FSI whenever a movable or deformable structure within or surrounded by a fluid flow, interact. Professionals have be extremely careful of the type of interaction - stable or oscillatory - as failing to identify oscillatory interaction can be highly damaging. Engineers have to be more careful of structures made of material vulnerable to fatigue. Hi-Tech offers analysis and design of Heating, Ventilating and Air Conditioning (HVAC). Hi-Tech offers HVAC analysis, HVAC simulation and HVAC modeling services including heating analysis, ventilation analysis and cooling analysis and air conditioning analysis. 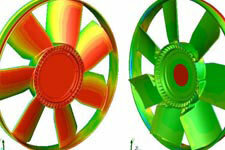 Hi-Tech is into offering Turbomachinery Analysis. Apart from this, experts provide services in simulation including turbomachinery performance analysis, turbo-machine design, preliminary design, detailed structure design and solid modeling. Hi-Tech has latest equipment to assess issues of or related to design.